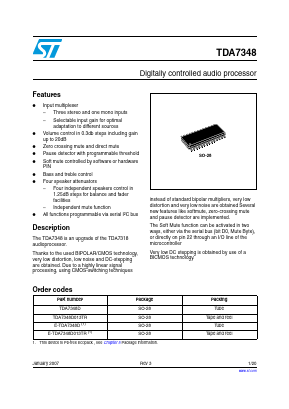 The TDA7348 is an upgrade of the TDA7318 audioprocessor. Thanks to the used BIPOLAR/CMOS technology, very low distortion, low noise and DC-stepping are obtained. Due to a highly linear signal processing, using CMOS-switching techniques instead of standard bipolar multipliers, very low distortion and very low noise are obtained Several new features like softmute, zero-crossing mute and pause detector are implemented.